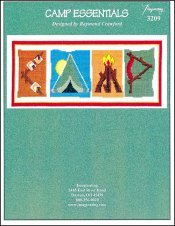 Camp Essentials [G7207] - $6.00 : Yarn Tree, Your wholesale source for cross stitch supplies. Cross stitch chart from Imaginating. Designed by Raymond Crawford. You have all of your "Camping Essentials" right here! The smell & heat of a fire ready to make dinner. The tent has been pitched for a good nights rest in the back country. Dessert means roasted marshmallows. There is no place like camp! Stitch count 184v x 81h. Stitched on #2936 Zweigart Aida 14ct White 59" wide or #8221 Zweigart Aida 14ct White 43" wide.